dotConnect for BigCommerce is an ADO.NET provider for working with BigCommerce data through the standard ADO.NET or Entity Framework interfaces. It allows you to easily integrate BigCommerce data into your .NET applications, and integrate BigCommerce services with widely used data-oriented technologies. dotConnect for BigCommerce has the same standard ADO.NET classes as other standard ADO.NET providers: BigcommerceConnection, BigcommerceCommand, BigcommerceDataAdapter, BigcommerceDataReader, BigcommerceParameter, etc. This allows you quickly get started with it and eliminates the need to study any BigCommerce data access specificities. dotConnect for BigCommerce makes it simple to create .NET applications in C#, VB, or other languages, working with BigCommerce data. It offers standard ADO.NET interface, and thus it's easy to master it. It's powerful design-time editors together with seamless Visual Studio integration allow you to work with BigCommerce data with less efforts and less code writing. See how easy it is with dotConnect for BigCommerce. That's all, now you can work with BigCommerce data right in Visual Studio - select data from BigCommerce entities and edit it. dotConnect for BigCommerce allows you to perform SQL queries against your BigCommerce data. Use SQL statements to work with BigCommerce accounts, contacts, leads, contracts, products, campaigns opportunities, and other objects. Our provider offers full CRUD (Create, Read, Update, and Delete) support and allows you to get BigCommerce data with SELECT statements and manage data with INSERT, UPDATE, and DELETE statements. No need to study and use complex BigCommerce API, just use familiar SQL statements. You may use complex JOINs, WHERE conditions, etc. - all the SQL benefits, not available with BigCommerce API. dotConnect for BigCommerce provides enhanced Entity Framework support for BigCommerce data with a bundled visual designer for ORM models with Visual Studio integration - Entity Developer. 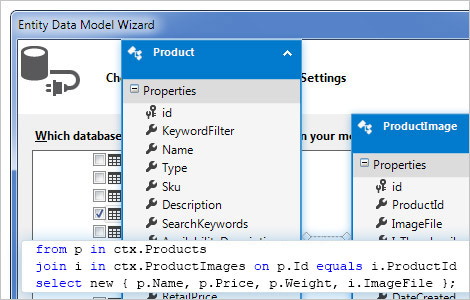 Standard Visual Studio Entity Data Model designer is also supported. Simple SQL statements are translated to BigCommerce API calls and executed on the BigCommerce side directly. 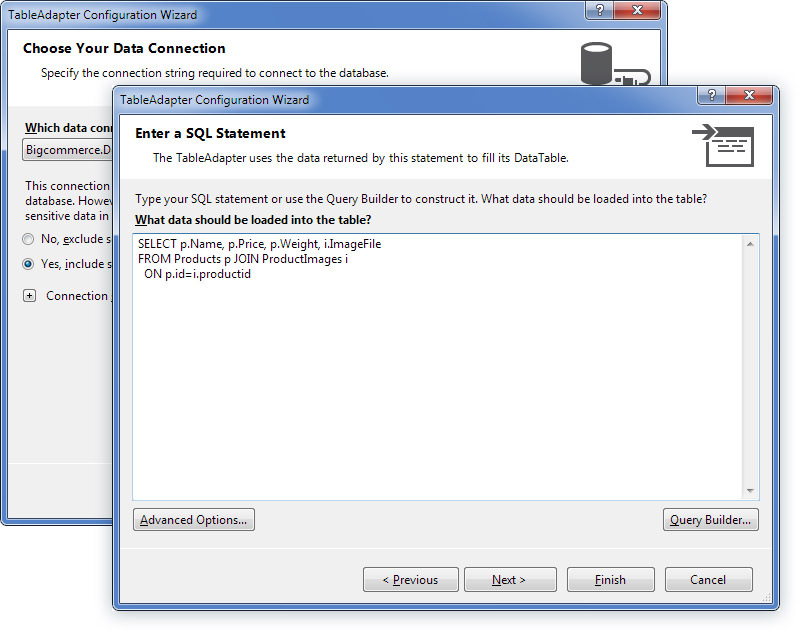 However, dotConnect for BigCommerce also supports more advanced SQL features, such as SQL functions or expressions, complex WHERE conditions, joins, etc. If you use these more advanced SQL features, dotConnect for BigCommerce queries all the data from the objects that participate in the query, and executes the statement locally. 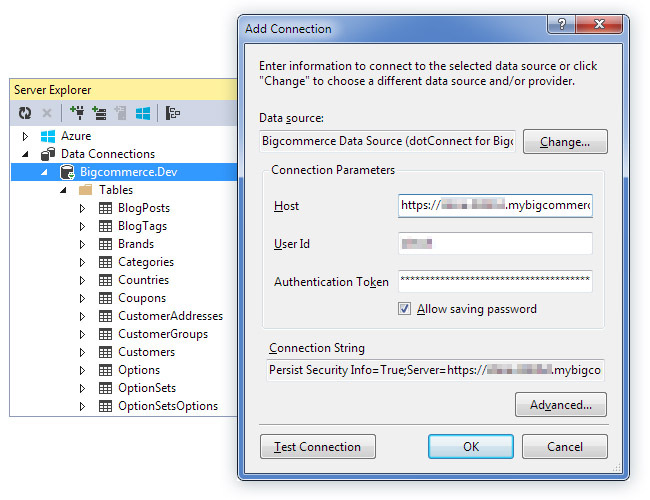 This tutorial describes how to connect to BigCommerce either from Visual Studio Server Explorer or from application code via BigcommerceConnection. This tutorial describes how to get BigCommerce data with the BigcommerceDataAdapter class or with BigcommerceCommand and BigcommerceDataReader. This tutorial describes how to manage BigCommerce data with SQL and the BigcommerceCommand class or with BigcommerceDataAdapter. You can get a significant discount, and even a free license, by spreading a word about dotConnect for BigCommerce.